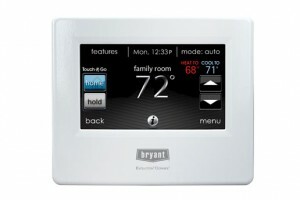 By programing your thermostat you can save some important dollars. Check out our “HOW CAN I REDUCE MY ENERGY COSTS?” details under our “HVAC For Dummies” section. We all protect our investment. Setting the thermostat a little higher in the summer or lower in the winter may cause adverse effects. If you live in a hot climate, your drywall and wood floors could get damaged. Lower temperatures in the winter can cause condensation and pipes may freeze. We recommend keeping the house temperature between 50-60 degrees in the winter and no higher than 80 in the summer. A few extra dollars in your utility bills might prevent extensive damage to your home. Keeping up with the latest technology can help save money too. Older thermostats can be upgraded to the newer Wi-Fi thermostat. These units can be accessed from anywhere. You can monitor the weather around your home and make the necessary adjustments to your home climate. Some units can alert you if the temperature drops below your set point. Today’s smartphones make our lives easier. By downloading an APP you get full control over your home’s inner environment. Having the correct settings on your thermostat is an important factor in controlling your home’s climate. Depending on the season, there are a few other things you can do to take care of your home. Close your curtains minimizing direct sun light. Since frozen pipes are a big concern during the winter months, draining the water is highly recommended. Keep cabinet doors under your sink open to help warm air circulate around the pipes.